Gramabar, located just outside of the Callao metro stop, is a great choice for anyone looking for tasty and authentic Latin food in Madrid. Gramabar specializes specifically in Venezuelan and Mexican dishes like arepas, burritos and nachos. The restaurant is very relaxing and is built for a tropical vibe with wooden seats, palm trees and a good amount of outdoor seating. The staff is extremely friendly and accommodating and they add to the chill and relaxing experience here. 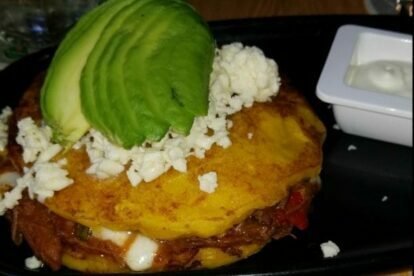 When it comes down to ordering, the cachapa is a definite favorite. This dish is served with white cheese, cream and avocado all stuffed into a corn tortilla. If you want meat also, ask for the carne mechada to top it all off. In addition to this, Gramabar has a great cocktail list filled with typical tropical drinks that will make you think you are sitting on the beach. They have great dark and stormys, mojitos and most importantly, sangria!